There is a general final evaluation so that all these values do not have to be interpreted after every test. 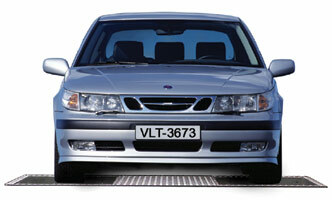 The Suspension Tester can be used in combination with a VLT Brake Tester. The two pieces of equipment are monitored by the same computer. A single display cabinet is used for the two pieces of equipment. The axle weight measured by the Suspension Tester is also used for the calculation of the brake efficiencies. Monitor models with 22", 27" and 32" large TFT-LCD monitors with full colour display for information and results.